Imagine living in ‘small town America’, where being different is social suicide. Imagine you’re a teenage girl who realises she is actually in love with a girl. This is Astrid’s story. The twist in the tale is that Astrid’s best friend Kristin is gay, and Astrid is the only person who knows. Kristin lives a fake life where she dates the most popular boy at school (he is secretly gay also) is on her way to becoming homecoming queen while really she is dating a girl from a nearby college. You would think that having a gay best friend would be a good thing fro Astrid, someone to talk to, but these new feelings are not something she wants to share with anyone. She can’t turn to her mother, who is highly strung with plenty of her own issues about ‘fitting in’ and not her father who seems to have become a stoner in his later years. What Astrid does do is talk to and send love to anonymous passengers on airplane. She lies on a picnic table in her backyard…sending love to strangers. It really is a gorgeous book about a girl questioning her sexuality. When the truth comes out (literally) Astrid’s parents accuse her of lying to them, to which she says, she hasn’t been lying, she wasn’t sure she was gay, she just knew that she had fallen in love and that person happened to be a girl. It’s about being strong enough to be yourself, even when you know it would be easier to pretend to be someone else. The title of the book comes from something Astrid likes to do…to lie in her backyard and send her love to anonymous passengers in the planes that fly overhead. As an aside to the main story, there are chapters from these passengers, each one dealing with a personal issue of their own. Next on my reading pile was another book dealing with a teenage girls' sexuality (see pic to the right), this was also set in a small town, but this one is set during the late 80s and early 90s. This one is much longer (480 pages) and it's a bit more full on, it's more explicit in regard to the physical side of relationships, there is drug use, and swearing. It took me a long time to read this book. Not because I didn't enjoy it, but because it wasn't exactly a light read. 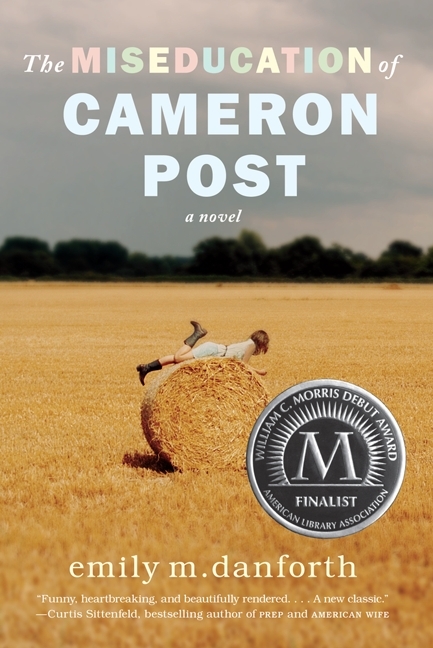 The story is told with such an honest and believable voice that I could only spend small amount of time with Cameron and her hurt, confusion and anger. While this book looks at how society in that time viewed homosexuality, it also looks at how the Church did. Cameron is actually sent to a camp that claims to 'straighten' teens out. Quite topical in fact as there has been something in the news recently about just this topic and gay conversion therapy.